The British weather is so unpredictable in May and we have days where we huddle under an umbrella on the school run all wrapped up followed by days of shorts and t-shirts, ice creams and bare feet. Our weeks aren't easy to plan and we are enjoying the spontaneity, looking out the window each morning and deciding what to do. 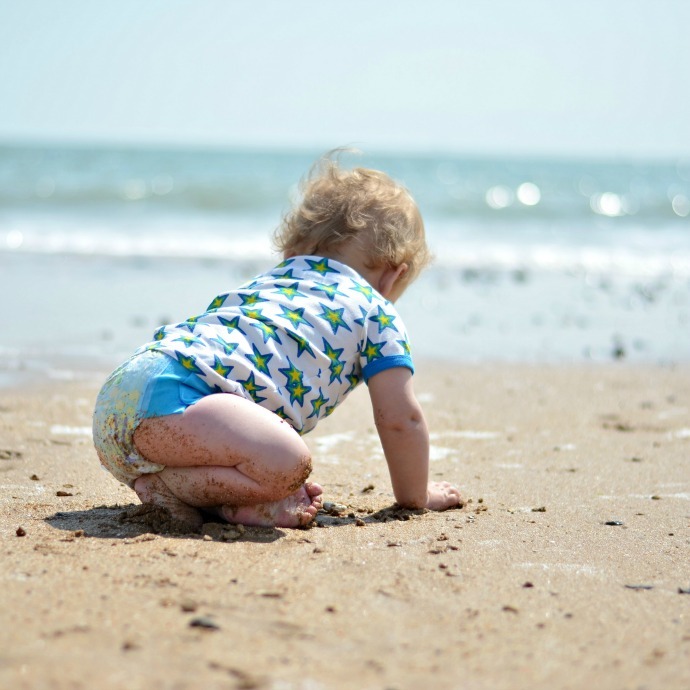 As a Huggies® Little Swimmers® ambassador we always have a couple of swim nappies in the changing bag ready to go and it paid off this week when we popped down to the town and realised how warm it was. Finn and I decided an ice cream at the beach was the way to go (well Finn fell asleep so I decided to get an ice cream) and when he woke up we had a lovely play on the beach and splash in the sea. He could happily crawl around in just a t-shirt and his nappy and it didn't swell up when he plonked himself in the sea to play with the wet sand. I love how easy the nappies are to just pull on and tear off and the great Disney© Pixar Finding Dory characters meant they looked really cute as he crawled around with his little bum in the air too. We made a little video about our mini-adventure and how easy the Huggies® Little Swimmers® are to get out and about with. I know the beach is going to feature heavily in our lives over the next few months, we are so lucky to have it practically on our doorstep and I love that my children are building memories so similar to my own from childhood. Our Little Swimmers are perfect for Finn for these days - the freedom to explore the sand and sea but the protection (for him and for everyone else!). How amazing s it to have a beautiful beach so close, the memories will be fabulous. I love the beach but it's a good hour away for a decent one. Swimmer will come in handy throughout summer. We've reusable swimmers, I've so many kids I need them lol. I wish we lived close enough to the beach - gorgeous pictures! I am so excited for the Dory film! I am lucky to have the beach at the end of my road. Those nappies look great and how cute does Finn look! We use Huggies Little Swimmers for my baby's swimming class and their so reliable.